Inder Loves Folk Art: More apron-talk. We enjoy cooking, knitting, crafting, sewing, etc. For us, it's a choice. But we can never forget that until really recently, doing these things was not a choice for many women. We also find the above activities expressive and creative. But again, we can't forget that until recently, these may have been some of the only areas of creative expression in women's lives. Because these actitivies have historically been considered women's work, society still doesn't give them the appreciation that they deserve, either as "art" or as valuable labor necessary for the survival of civilization. Of course aprons are practical, and of course, making practical things pretty is fun. 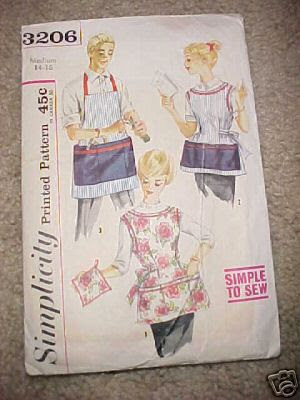 But cute ruffly aprons also reflect a 50s aesthetic that, at the time, was inextricable from a cultural aesthetic that said that proper, middle-class women should stay at home and out of the workforce. I forget where I read this, back in my UCSC Anthropology days, but someone theorized that fashion gets androgynous during major feminist upheavals, and gets wasp-waisted during the backlash. Case in point, the 1920s vs. the 1930s. Or even more dramatically, the 1940s vs. the 1950s. I'll keep this in mind while I'm sewing up my 1950s summer dresses! I'll let the waist out a bit to make it girdle-free, however. Fashion is also a mode of expression (traditionally a woman's mode, again), and the adoption of "nostalgic" and "retro" styles involves complicated, layered symbolism. That is, when I wear a vintage 50s dress to work, I am definitely expressing something about feminity and the feminine body, but in a completely different context than a 1950s housewife would have. That is, I don't think we can ignore the original context of our fashion choices, but we also can't ignore the current-day context. When I wear a 1950s dress, part of my statement is that I don't have to be rail-thin and flat-chested to feel pretty - other aesthetics exist. Also, I don't have to look masculine to be good at my job. These days, a lot of women prefer vintage fashions because they tend to be more forgiving and flattering to women who have a little meat on their bones. This is important too. At some point, I'm overthinking this and should just go back to enjoying life. After all, I believe that making things with you own hands and expressing yourself creatively is basically satisfying and essentially human. Another basic anthropological fact: humans are artistic creatures. We decorate ourselves and our surroundings. Cave people must have been pretty busy trying to survive, but they found time to paint on the cave walls. Frontier women were similarly busy trying to survive, but they took the time to put ruffles on their aprons. You can't completely forget the history of craft as a primarily woman's art, but at the same time, craft is much bigger than gender. If you're still reading, you'd be interested in this book: "Make it Yourself: Home Sewing, Gender, and Culture, 1890-1930," by Sarah A. Gordon. I haven't finished reading it yet, but so far, I'm very excited. Fashion is not a traditionally female mode. As Virginia Woolf observes in Three Guineas, men have historically had equally complicated get-ups. It's just that their get-ups have been institutionalized as Very Important and Necessary For Upholding the Fabric (hah!) Of Society, while women's fashions are institutionalized as Frivolous and Vain (even though they were usually in fact necessary, since women were on the market as personal accessories for men). To wit: military uniforms, academic regalia, the Shriners and similar all-male clubs.